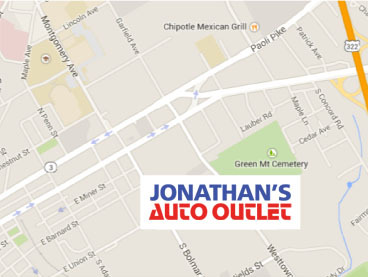 Scroll down to the bottom of the page to our comment section to write a review about your experience with Jonathan’s Auto Outlet. Very happy with the vehicle that we originally purchased from you, also happy with the follow up service that we have received since buying the vehicle. We will be returning for routine maintenance, and will definitely consider future vehicle purchases as needed. Thank you for the follow up. Purchasing a car from this company was an amazing decision! I bought my 2012 Toyota Camry from Jonathan in April, 2017. There were initial complications, however they were determined to do all they could to help fix it. They are very genuine people, driven by their goal to make YOU happy with your car, and I am so happy to have dealt with all of the employees there. Jonathan’s Auto Outlet is my #1 recommendation if you’re looking to purchase a car, and we will certainly look here next time we need a car! I bought an SUV from Johnathans Auto for the local American Legion. He allowed me to take it to my mechanic to have the SUV inspected. My guy did find issues with the SUV but I know my garage guy is a nit picker. Anyhow, Johnathan repaired everything on the list and did it in a timely manner. Almost a year later I have not had any issues with the SUV. I am planning to buy from him again. We bought a 3 year warranty with the auto. This warranty covers a lot. They were great! I highly recommend them!I bought a Dodge Dakota and they were extremely accommodating. They all worked with me and went out of their way to make my buying experience excellent! The truck was in pristine shape and we absolutely love it! Thanks guys for all your help! I would highly recommend this automotive repair shop to anyone. The always seem to be able to squeeze me in at a moments notice and they do great work at a very fair price. You know when you take your care to DARE that they are not just going to tell you there are a bunch of things that need to be fixed just to make money. They give you an honest evaluation and they don’t try to up sell you. If you need your car repaired and you don’t want to be taken advantage of at the dealer, this is the place. We purchased an Acura MDX at a terrific price, in great condition, at DARE auto. At the time of the sale (winter) they promised to fix the A/C when we brought it in months later — and they did — a free $500+ job. Excellent service, honest, great prices, good used inventory. I’ve known Jonathan and Laura for years now. DARE is the only place I bring my cars because this family run business is competent, fair, honest and above all trustworthy. I NEVER have to worry about whether unnecessary repairs have fattened up the bill, or that the bill isn’t anything but market competitive or usually, way better. They get things right almost all the time and absolutely stand behind their work if they don’t. Over the years I’ve brought in foreign and domestics of all makes and their trained staff handles them all. I would absolutely buy a car from Jonathan, anytime. Let’s be real here too, Jonathan is giving cars a ‘second life’ so many have 100k miles or more. That said, their age and miles usually means they cannot possibly be as reliable as new but that’s no fault of this dealer. Jonathan goes through all the cars and won’t sell one that isn’t safe and ready to drive across the country, and that’s not something you could say about too many small dealerships. In today’s age of sketchy shops and dealers it’s usually hard to find anyone you never have to second-guess or ‘keep honest’. DARE is one of those rare places. I had an amazing car buying experience! The car I looked at was inimmaculate condition. All it needed was a center console & a o2 sensor and it was replaced as promised! Thanks for your purchase. We are happy that you are enjoying the car you have been searching for. I wanted a cheap but reliable car for my daughter. I did some searching on cars.com and this 2002 Taurus seemed to meet my needs. Jonathan was so relaxed about letting me go out to test drive it, then allowing me to take it 20 miles away to my favorite mechanic. I wanted to make sure that I was making the right decision, so I called Jonathan with so many questions over the next three days. He returned every one of my calls promptly and patiently, and was willing to do anything I wanted to make sure that this car would be healthy. I’ve only owned this car for about five hours. But I’m already certain that I’ve done the right thing. After searching several months for a specific used truck, I found it at Jonathan’s. The staff was extremely accommodating, staying open late on a Saturday so I could test drive it. The truck was completely checked over and serviced by their expert shop. It was very competitively priced and dealing directly with the owners gave an additional sense of confidence. Overall, you can feel very comfortable with buying a used vehicle from Al at Jonathan’s or using their service department DARE. I started taking my car to Jonathan many many years Everyone in the shop are always so pleasant, and Laura his sister is sooooo sweet, love all the mechanics there, their always very accomadating and helpful. I always recommend Jonathan’s to everybody who asks. Thank you. I’m glad we could serve you, whether buying a quality pre-owned vehicle or servicing your car at DARE…all makes and models. We had a good experience. Dealer worked with us to find the car we wanted. Thanks, so much for your purchase. I think your daughter will be served well by this Civic. Please consider us for your future purchases and mention us to your friends. Click on a logo below to write a review of your experience at Dave's Auto.